owls about that then! : A morning of Juveniles. Getting out of late has proved difficult, too busy doing other day to day chores and other family commitments taking priority. However, I did manage to sneak a few hours to myself over the weekend and managed to latch onto some recently fledged individuals of the "hooked bill" variety! Firstly a bird that I have never really had any good close up views of, the Peregrine Falcon. I have seen plenty of them over the years but they have always had a knack of eluding me when it comes to attaining any usable images. So when I heard through the birding grapevine of four recently fledged juveniles that were quite "showy" I just had to investigate further, especially as they were only a few miles from home. My main aim was to see if I could get some flight shots, so armed with my trusty 300mm F2.8 lens and great light levels I was confident that with a bit of luck I could achieve my objective, so as long as the birds were still there? I know the site in question very well and if I was to get the shots I was after it was going to be an early morning visit because of the direction of the sun. I arrived at the "secret" location at about 6.30am and it took all of 10 seconds before I spotted the first bird, then another and another, the three of them were perched up in a distant dead tree. The next 30 minutes offered nothing different other than the 3 falcons sitting in a distant tree! Then the distinctive calls of adult birds was heard, I honed in on their calls and finally they were spotted up high circling around. And for the duration of my stay that was pretty much how it stayed, adults circling around and the three juveniles in the tree, all too far away, doough!! However, there was a fourth juvenile at this site and that bird proved to be my savior, it was spotted perched on the roof apex of a nearby building and there it too stayed all the while I was there. Initially I wasn't able to get that close so I had to be satisfied with distant shots (albeit my best ever of this species) that still had to be consequently cropped, below. I was able to get nearer to the bird on the roof but the steep viewing angle only allowed for a head shot. In total I spent a good hour with the Peregrine family before I opted to move on. At the next location I was on the trail of Little Owls, the weather was just perfect, (IE no wind and very bright) to hopefully discover a fledged owlet or two perched up sun bathing. 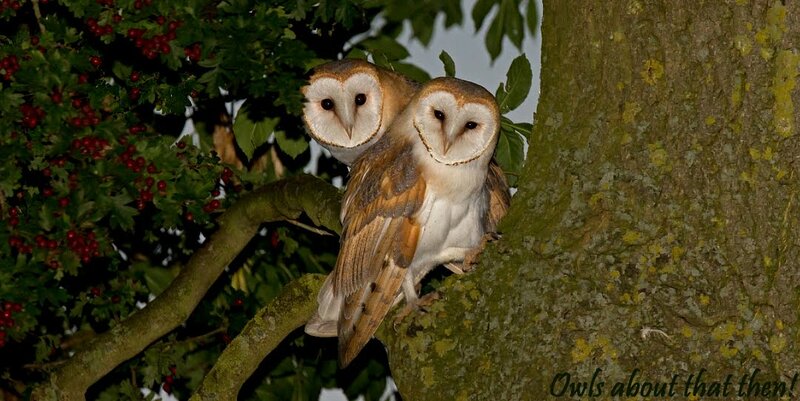 A couple of different sites did produce some owl sightings but too distant to capture an image. At the third site, I investigated an old dilapidated Ash Tree that in the past has proven to be a good breeding site for Little Owls. Before I got too close I scanned the tree through my binoculars and what came into view was a bit of a surprise, poking their heads out of the nest hole were not Little Owls but four Kestrels!! I made my way closer to the tree trying to be as quiet and as inconspicuous as possible, not easy in the Landrover! Before I'd even got even halfway to the tree the young Kestrels took to the wing, obviously I wasn't inconspicuous enough! One of the Kestrels did return to the tree but it kept partially hidden behind the Ivy, below. 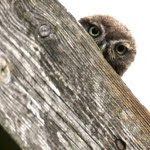 For the duration of the morning I did see juvenile Little Owls "out of the nest" at another 7 different sites, but only the one site offered a "usable" image below. Thanks for dropping by, catch up soon! It's great to see the juvenile Kestrel, all three species make my gadren juveniles quite plain and boring in comparison, let's hope we get see some more. These Peregrines are using a "traditional" site Doug, and I am not surprised to hear they are your No 1 bird, they are pretty high on my favorites list too! The Kestrels were an interesting find mate!!! Indeed they were Col, always good to see! I'd have been happy just with the sightings, but you've captured them beautifully, Paul, with your camera. Brilliant! I love the Peregrine Falcon, and you photographed it, superb.